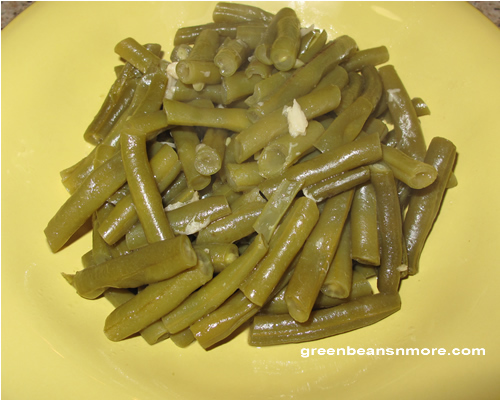 Our very favorite green bean recipe. One of our favorite seafood restaurants is in Rock Hall, Maryland. It's called Waterman's and they make the most delicious green beans we've ever had. We tried and tried to figure out the seasoning, but we couldn't. OK, we easily tasted the chicken stock, but there was something else, something we couldn't quite put our fingers on. Well, believe it or not, that something else is garlic, yes, garlic, and LOTS of it. I have experimented with this recipe many times over this past several summers. It's one of those rare recipes where you really need to simmer the beans for a long, long time. I start with 2 pounds of green beans that I rinse and trim. I use low sodium chicken stock, a 32 oz. carton. Add 1/2 stick of unsalted butter. Add between 6 to 8 whole peeled garlic cloves into the stock and bring it to a boil. Remember, garlic gets sweet as it cooks. Put in the cleaned and trimmed green beans. Add a bit of salt and pepper. Stir occasionally and add water as needed to keep the beans just covered. Simmer them up to 2 hours but at least one hour. The longer they cook the better. I think the secret is that the longer it cooks the more mellow the garlic becomes and the more the flavors meld together. Before serving I add more salt and pepper, if it's needed. They're yummy, or as my husband calls them "guest worthy." This recipe works really well with more mature green beans. Anytime I cook green beans now I do so in low sodium chicken stock. I think it adds a wonderful depth of flavor, even without the garlic.